On what started as a snowy April day in Cleveland, a hardy team of volunteers from the United Church of Christ national staff could be found planting vegetables and chasing chickens in a community garden on the city's west side. Luckily, they were inside a greenhouse out of the wind. "The group today was amazing," said Rev. Mariah Hayden of UpCycle Farm. "They were complete rock stars — we started with freezing temperatures and snowy soil and ended the day sans coats and hats with the sun shining. 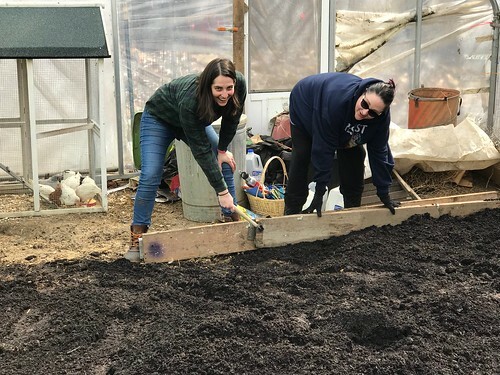 They moved approximately 7 cubic yards of pure compost, built and filled a new raised bed for root vegetables, cleaned up a winter's worth of trash, planted peas and potatoes, and managed—with some patience and trickery—to corral a few stray chickens. The group was hearty, fun, and ready to tackle what I needed done." Upcycle Farms has reclaimed city land in Cleveland for a working farm that addresses the food desert in that neighborhood west of downtown. The farmer, the Rev. Mariah Hayden, is an Adese Fellow and United Methodist minister. "Because of the morning's snow, our group was not able to do all the planting we had hoped to do, but we had plenty of work! Our arms were sore, but our hearts were full, knowing that this work is part of a ministry working within the Cudell neighborhood and alongside its residents," said the Rev. Elizabeth Dilley, Minister for Ministers in Local Churches. The farm group was one of several teams of UCC staffers practicing love of neighbor, love of children and love of creation, by volunteering their time and talents at six different sites across Cleveland on Thursday, April 5. "We selected several programs and organizations that gave us the opportunity to support our 3 Great Loves—love of neighbor, love of children and love of creation—in locations that have welcomed us in the past," said UCC Human Resources Director Alisa Lewis. Her HR team organized day of service and sent UCC staff members off with a hearty breakfast and a snack. "I want to say thank you to all of our staff who volunteered," Lewis said, noting that this will become an annual event. "We're excited to be able to spend time helping out in our community." In addition to the contribution to growing vegetables for those who don't often have access to them, UCC staffers landscaped, painted, prepared meals, made blankets and read to children over the course of the day. "I enjoyed the blanket making experience because kids, growing up, always have their comfort blankies," said Shameerah Lemon, Associate for Event Management. "It was nice to be able to make these blankets for kids who might not have them." The UCC blanket makers will be sending the cozy fleece to Project Linus, a national non-profit organization that provides homemade blankets to children in need. The blankets, created on site at Church House, will be blessed during the Amistad Chapel service on Sunday before they ultimately are given children who are hospitalized. Another service team sharing love with children reported for duty at Adlai Stevenson Elementary School on the city's east side. "The kids in the kindergarten class I was placed in were wonderful! The opportunity to sit with them and do some of their reading work was rewarding for me, and hopefully helped them as well. They were interested and eager to learn," said Peter Makari, Team Leader for the Middle East and Europe, Wider Church Ministries. At lunch the kids kept Makari so busy peeling oranges, he barely had time to eat, but said he found the experience "simply delightful. I'm glad we went and hope we can arrange similar opportunities in the future." Three other teams, with love for lots of neighbors, packed lunches at the food bank, did some painting at a center for that provides a safe place for women and children, and volunteered at the Magnolia Clubhouse, an agency that assists members with mental health disabilities. 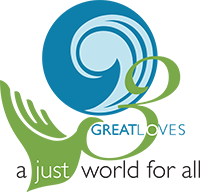 "UCC Volunteers worked alongside members to clean the house, prepare lunch, and create the day's news program," said Nichole Collins, Associate Director, Annual Giving. "We showed love of neighbor by helping to provide the clubhouse members with job skills and sense of community." "We LOVED the team that served here at Laura's Home Women's Crisis Center," said Jaime Buxton, Internship & Volunteer Services Supervisor at the City Mission. "They came enthused about what we do here and ready to give! They painted our stairwell and finished in record time. Thank you so much for allowing us to be part of this day!" "We had 14 great volunteers from the United Church of Christ out today for a four hour shift back in our community kitchen," said Alan Fratus, volunteer services manager for the Greater Cleveland Foodbank. "Some of the group packed lunch bags for our youth programs. Some of them helped prepare meals in the kitchen, pasta and fruit cups. Many thanks. They all had a good time." "Our service day was a great day of community building," said the Rev. Ivy Beckwith, Faith Formation Team Leader. "I got to know some of our new staff a little better and caught up with other staff I don't see on a daily basis." "I'm so grateful for their enthusiasm and the invaluable contribution to growing vegetables on Cleveland's west side," Hayden said. "Folks went home tired and sore, having worked incredibly hard from the winter morning through the 70+ temperatures inside the greenhouse. Thanks so much UCC!"